Here at Hog Roast Sutton Coldfield, we have many loyal returning customers who clearly love our food and are impressed with our service. We try our utmost to ensure that our food is delicious, homemade goodness that can be enjoyed by all and that our service is second to none, so repeat business makes our chef and team members very happy indeed. When it comes to providing variety and choice, we really do push the boat out on behalf of you, in order to impress your guests and make sure that everyone is able to eat at your party or event, so that means we cater all kinds of dietary needs as well as personal tastes. When Suzanne called us a few weeks ago to book a hog roast for an intimate private party at her home, she also needed to cater for a vegetarian guest. 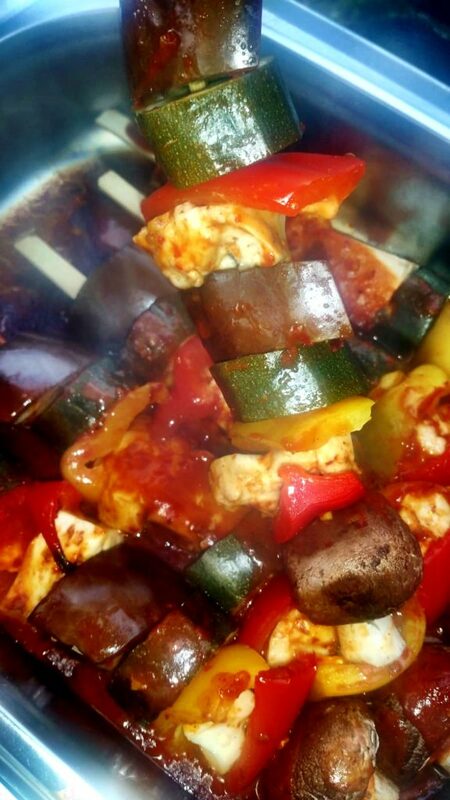 Our grilled veggie skewers are extremely popular for vegetarians, as they feature chunky halloumi pieces and fresh vegetables including mushrooms, courgette, peppers, red onion and tomatoes, and are served with a delicious Tzatziki dip and pitta bread. So Suzanne asked us to provide this option and to also cook a traditional hog roast to make pig in buns for the rest of the guests. On the day of the party, Hog Roast Sutton Coldfield arrived at Suzanne’s home several hours before we were due to serve the food, and got busy setting up our equipment and preparing the meat to be roasted. We met with Suzanne, who apologised profusely and said she realised she actually needed a vegan option, not vegetarian, and asked if this was at all possible. By not adding the halloumi cheese and not serving the Tzatziki dip, we can easily make our veggie skewers vegan instead, and they are still very tasty because of the various fresh vegetables that we grill to perfection. By 5.30pm, it was time for Hog Roast Sutton Coldfield to serve up plenty of succulent pigs in buns and some lovely vegan skewers, and both went down a treat with the guests – so much so that Suzanne booked us in to cater her wedding anniversary next month too.